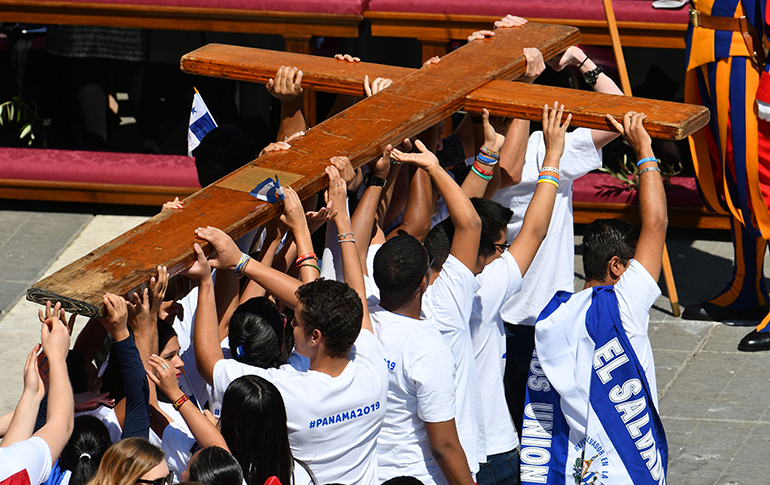 Young people from Panama and other parts of Central America carry the World Youth Day cross during the Palm Sunday Mass, April 9, 2017 at St. Peter's Square in the Vatican. Panama will host the 2019 World Youth Day, Jan. 22-27, 2019. 8:30 a.m. — Mass with Archbishop Thomas Wenski and visit with the homeless, immigrants and the poor at the Missionaries of Charity shelter, 724 N.W. 17 St., Miami. 1 p.m. — Encounter with the youth: for high school students from the archdiocese who are going to World Youth Day, at Msgr. Edward Pace High School, 15600 N.W. 32 Ave., Miami. 5:30 p.m. — Prayer for vocations: Mass with Archbishop Jose Domingo Ulloa of Panama, Archbishop Wenski, and seminarians and religious, at St. John Vianney College Seminary, 2900 S.W. 87 Ave., Miami. 7-10 p.m. — Vigil and concert: Worship, reflection and multicultural celebration on the grounds of St. John Vianney Seminary. The visit is part of the WYD cross and icon's multi-city tour of the United States, the first time in 25 years such a coordinated journey has occurred. Archbishop Ulloa of Panama extended the Latin American tour of the symbols to include the United States. The cross and icon will stop in Chicago before coming to Miami, then continue to Houston, Washington, D.C., and Los Angeles. The cross has traveled around the globe since 1984, when St. John Paul II gave it to young people. It has been part of every World Youth Day celebration beginning with the first one in Rome in 1986. In 2002, the cross came to Ground Zero in New York City for a brief visit to bring comfort to the nation's young people in the aftermath of the 9/11 terrorist attacks. In 2003, St. John Paul II presented the world's youth and young adults with a Marian Icon, under the title of Salus Populi Romani, which has accompanied the WYD Cross for the past 15 years. About 140 teens and young adults from throughout the Archdiocese of Miami will be going to World Youth Day in Panama. For more information, contact the Office of Youth and Young Adult Ministry, 305-762-1189; rbanich@theadom.org or mducker@theadom.org.